Bridge buffs know the value of their high cards very well, but they sometimes overlook the value of the little spot cards. However, this is never the case at the Sevens and Under Public House. There was a happy buzz of conversation in the Sevens and Under Public House the other night when the little Six of Hearts called for everyone’s attention. “I have a happy little story from today’s bridge hands,” he said. “Hear, hear,” the other spot cards yelled. He diagrammed the above hand on the blackboard the spot cards use for the purpose of telling a bridge story. “Always a good choice,” the Five of Spades said. “This is getting quite exciting,” the excitable little Deuce of Diamonds said. The entire public house – even the Seven and Five of Hearts – broke out into cheers for the heroic Six of Hearts. 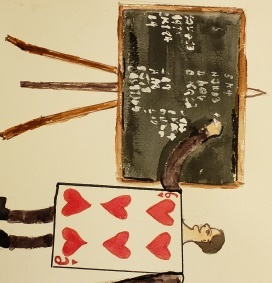 This entry was posted in bridge friends, Bridge Hands, Bridge Humor, Bridge Rivalries, Fiction, Humor, Stories, Uncategorized and tagged A Very Welcome Promotion for the Six of Hearts, Bridge, bridge buffs, Bridge Club, Bridge humor, bridge rivalry, duplicate Bridge, Sevens and Under Public House, small slam, The Six of Hearts. Bookmark the permalink.